This talk will give an overview of Mrs. Ilya Marotta's work on the expansion of the Panama Canal project. 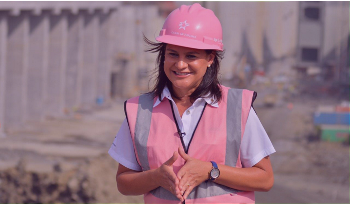 She is an Executive Vice President of the Panama Canal expansion project’s Engineering and Programme Management. The first phase of execution began on September 3rd 2007, in a spectacular blast of rock and soil at the south west end of the infamous Culebra Cut. Expansion works began immediately on multiple fronts such as dredging, construction of locks and dams, navigational aids and a sundry of other integral components that would be the “New Panama Canal”. As with the original construction of the Panama Canal, the challenges unfolded in almost every aspect of the program. And they came in expected diverse numbers and frequency, including; design of locks components, labor relations, logistical flow, contractor relations, legal claims, unexploded ordinances at construction sites, delays and much more. Challenges, it can be said, are as much part of this project as is the actual construction. The only difference being, most of the time the construction goes according to plan, challenges are the uninvited guests who can’t be ignored. Every day is a challenge. The Project is 96% complete. What remains is…..
As a young student she discarded all the career options then thought suitable for a woman and opted for a profession which, at the time, was exclusively a man’s world. After being awarded her Bachelor’s Degree in Marine Engineering from Texas A&M University in Galveston, Texas, USA, she completed her M.A. in Economic Engineering at the Universidad Santa Maria La Antigua in Panama. As she worked her way up in the world of engineering and project management, she studied Management Development at INCAE (Instituto Centroamericano de Administración de Empresas) Business School and a few years later at the Kellogg School of Management. In 2007, she was certified as Project Manager by the Project Management Institute. Ilya’s place at the forefront of such an important engineering project comes after 20 years of work on the canal during which she explored every corner of it. She first served as a design engineer in the Industrial Division, repairing floating equipment. She also worked as a mechanical engineer in the Engineering and Dredging Divisions.